The threat of rain is not going to stop this weekend’s 12th annual Dam Dog Walk at the Hartwell Dam. Sponsored by the Hart County Humane Society, the event is scheduled for Saturday from noon to 5p at the Big Oaks Recreation Center on Highway 29/the Anderson Highway in Hartwell next to the Dam. 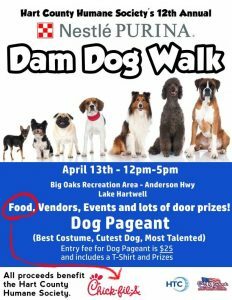 According to Humane Society President, Donna Madkiff, this year the Dam Dog Walk will kick off with a formal pet parade along the path to the Hartwell Dam. “There’s an organized parade on the dam. So, that’s a lot of fun. Everyone starts out at one time. There will be stops all along the walking trail on the dam with giveaways, gifts and door prizes. Purina is going to do a lot of that. There’ll be little activities to do. You don’t have to walk the whole way,” she said. Later Saturday, there will also be a Pet Pageant that pet owners can enter for $25. Madkiff says that will also include prizes. “The pageant is only three categories this year. So, we hope that will be a little less hectic. The winners will get a medal and Lavonia Pet Salon will award a gift basket. So, it’s going to be a lot of vendors and food vendors. Chick-Fil-A will be there. We think it’s going to be a real good event,” Madkiff said. Pet Pageant categories include Best Costume, Cutest Dog, and Most Talented. If you don’t take part in the pageant, you can still buy a T-shirt for $25 each. This is one of the Hart County Humane Societies major fundraisers of the year. Proceeds are used to pay vet expenses for some of the sick animals they rescue from the Northeast Georgia Animal Shelter in Lavonia. Madkiff says right now they have several dogs who are in need of major vet work. 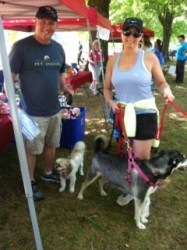 This year’s Dam Dog Walk is sponsored by Purina, which is building a new pet food plant in Hartwell. In addition to the walk, Madkiff said food and craft vendors will be on hand as well as dogs available for adoption. The Dam Dog Walk is open to everyone and there is no charge to come and walk the dam with your dog. 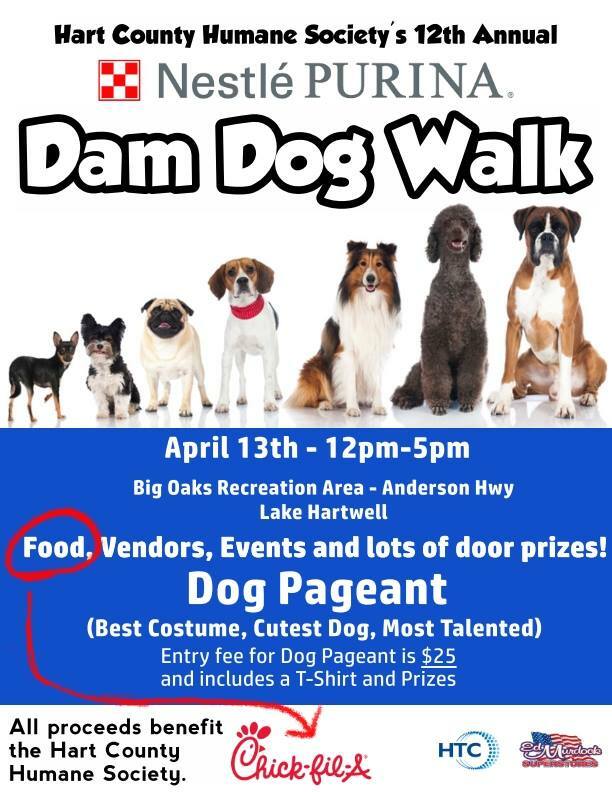 Again the 11th Annual Dam Dog Walk takes place Saturday from noon to 5p at the Big Oaks Recreation Center on Highway 29/the Anderson Highway in Hartwell. For more information, contact the Hart County Humane Society at 706-376-1769.